Have You Ever Had A Sizzling Online Connection? Last week, I became a true believer in online connections. No I am not talking about Match.com, I am talking about an amazing group of women, Chicks Who Click. They mean business when it comes to connecting online gurus with the tools, trends and training to make us truly twitterrific. Enter in my newest online friend, Suni Hayes, of My Office Zilla. Not only have I never met Suni face-to-face, but this kind stranger invited me to this week’s upcoming Chick’s Who Click conference, for free. She checked with her friend Shawn Kinkade, who then then checked with me and the rest is history (sounds kinda like the game of telephone, huh?). What’s more, I have already met two other people, online who I can’t wait to meet at the conference this weekend. Here’s my shout out them: Denise Smith and Elaine Ellis. So what’s this got to do with your business? Well, if you’re not connecting with others and planting solid seeds for future connections to grow and flourish, you may just be watering barren soil, if you’re not using some kind of social media strategy. Social media outlets like Facebook, Twitter and of course my favorite, blogging, can really give you a voice in a world of multiple messages. Here are a few keys to making your marketing message loud and clear, so you’re heard and people have your product/service “top of mind”. One of the key things to keeping your message front and center is to make it concise. Yes, as a writer this is very hard, but when it comes to getting your message out there you want sweet, short and simply spectacular words. After all, if you’re sending out a tweet to your customers, you only have 140 characters to broadcast your message, so make them work for you. Bottom line create a relationship with your customers and be real. That’s what social media is all about. I often hear many of my clients tell me that Twitter doesn’t work because most people don’t care when someone is brushing their teeth. I agree, don’t bore me with a bunch of useless details, but have you thought how important a “brushing my teeth” tweet might be to someone selling toothbrushes? Look for opportunities to connect. What if you are an owner of a hair salon and someone tweeted: “Having a bad hair day, don’t laugh”. Image how you could make that person’s day if you instantly got back to them and offered a half-price haircut & style at your shop? I am pretty sure I would remember that and probably tell all my twitter followers about it. In addition, offer up useful information, helpful stats and interesting stories that bring life to your Facebook page or blog. It is amazing how posting a story about someone struggling with time management can make quite bit of buzz on your site. If you can provide tools to help your audience’s business or even life easier, they are going to remember you. With so many layoffs, I keep hearing multiple stories about how Linked In saved a person’s bacon. As a pink slip hit their desk, there was no need to worry about their connections. They didn’t need to search for the company directory or grab their desktop rollodex. All the contact info they would need to notify their business connections was saved and easy to access online, from anywhere, not just the workplace. What’s more, LinkedIn offers you a chance to help others. Whether it be an upcoming event you think might be helpful, writing up a testimonial for a fellow co-worker or even feedback on a book you just read that has changed your life, you can offer up a lot of valuable information to your connections. In addition, searching your connections, connections is a great way to meet new people and if you’re the one that received that pink slip, perhaps meet your new boss. The most powerful thing I have found so far with social media is the power of meeting new and old friends/co-workers/neighbors. The sense of community that is created within the social media sphere is quite exciting. I can’t think of the last time a print ad made me feel so great, well maybe if it was advertising chocolate, but that’s different. I have met some of the most brilliant marketing pioneers out there and I must say, they are just as personable as if I had known them for years, Colleen Wainwright. Not only have I met new friends, I have found some old friends, co-workers from my old TV days. Bottom line, we as humans want to have solid, dependable connections. Which makes being a business owner quite a way to make an impression through tapping into that human desire and delivering a memorable, lasting connection and experience. See where social media can take you next. I would love to hear more about your journey-leave me your comments. So as I prepare for the upcoming conference, I look forward to sharing more insight on social media and how your business can move to the next level creating and retaining lasting customer relationships. Stay tuned …. 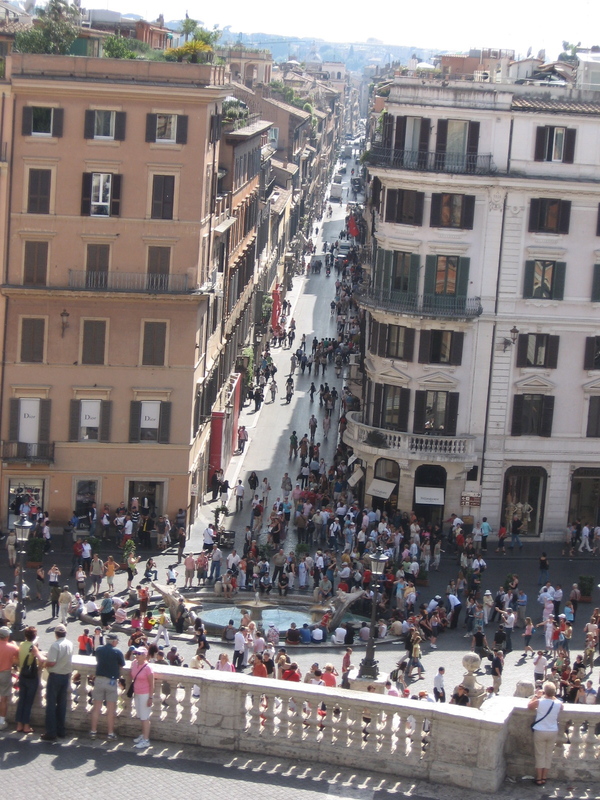 A few years ago I was in Rome and couldn’t believe the mass of humanity all around me. It was amazing. All walks of life, young people, old people, people looking for love, people in love and lots of people withstanding the loved ones they were with … you get the picture. So, when I stood on at the top of the Spanish Steps I wondered, what if I could yell hello to everyone standing below and grab their attention all at once? I could say hello in at least 5 languages, but surely I would leave someone out and not be able to connect. I think we often craft our marketing messages in much the same fashion. We go out there, try to yell hello to the entire group without thinking how to connect with the right words and phrases. This is why it is so vital to craft a message and generate a concept that is truly unique to the product/service you are promoting. This is why utilizing an accomplished freelance writer makes sense. They often have a strong foundation of client experience and bring a wealth of knowledge to the table. It’s great ideas that your company can build upon and use to create a free flowing stream of solutions for your business. Yesterday I discussed two reasons for hiring a freelance writer. I want to continue this discussion with one of the most important reasons to hire a writing expert. One of the most important things your writer can do is effectively brainstorm. It is key for a writer to know how to concept not only with you the client but also with the rest of the creative team. Having the ability to work with multiple business cultures, personalities and daily-to-day challenges is vital when crafting a cohesive message for your clients. Often, a staff writer is unable to change the team’s mind when it comes to effective writing and what makes sense for the target audience. Let’s face it, they work together on a day-to-day basis and often begin talking the same speak. They may even loose the ability to communicate to the potential customer in a way that captures their attention. An experienced freelance copywriter is steadfast in their idea generation and can produce hard-hitting concepts that generate results. They see “creativity” as only a portion of the process and often look to other places, besides their own lives, to concoct successful ideas. They have a multitude of client experiences and bring that expertise to the brainstorming session, which can be invaluable. When it comes to generating ideas I look at it as how “powerful” is the concept and then I focus on how “creative” is the concept. Here are some questions to ask to ensure powerful communication over creative fluff. These are just a few things to consider when crafting your message for effectiveness and connection. Hiring a seasoned writer who has a handle on brainstorming and how to craft a message with a team is key to the success of a company’s marketing message. Tomorrow will conclude our discussion of the Top 5 reasons to hire a freelance writer.